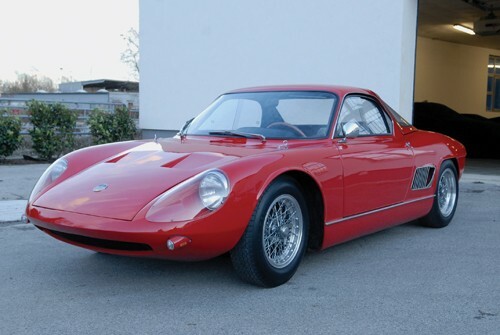 Think Ferrari was the first Italian car company to build a mid-engined road car? Think again. ATS (which stands for Automobili Turismo e Sport) introduced the 2500 GT road car in 1963 with a 220 horsepower 2.5 liter V8 mounted behind the driver but in front of the rear axle. About 12 road cars were built. ATS tried their hand at Formula One in 1963, quite unsuccessfully, retiring from four races and only finishing one: their home Grand Prix at Monza with drivers Phil Hill and Giancarlo Baghetti. When that endeavor failed, they thought “hey, we’ve got a powerful road car on our hands, let’s go road racing!” And thus the 2500 GTS was born. Power was bumped up between 245 and 260 and the car could do 160 mph. No public record exists as to how many GTS models were built, but it is thought to be around five, with only three still in existence. No price estimate is available from Coys but to read the entire lot description, click here. And for the complete Techno Classica lot list, click here. This entry was posted in Uncategorized and tagged 1963, 2500 gts, ats, auction, car, classic, classic car, coys by classiccarweekly. Bookmark the permalink.